Southeastern Kodiak Island, including all of Aliulik Peninsula, Kiavak, Kaguyak and Portage Bays and Russian Harbor. See area map (Image file 59 kB). The northern portion is mountainous with peaks up to 1959'. Topography includes rolling hills, wide valleys, and mountains with moderate to steep relief. The southern portion is primarily flat bench lands, with tundra vegetation, lakes and shallow ponds, numerous drainages, hummocks, and intermittent alder and willow patches. 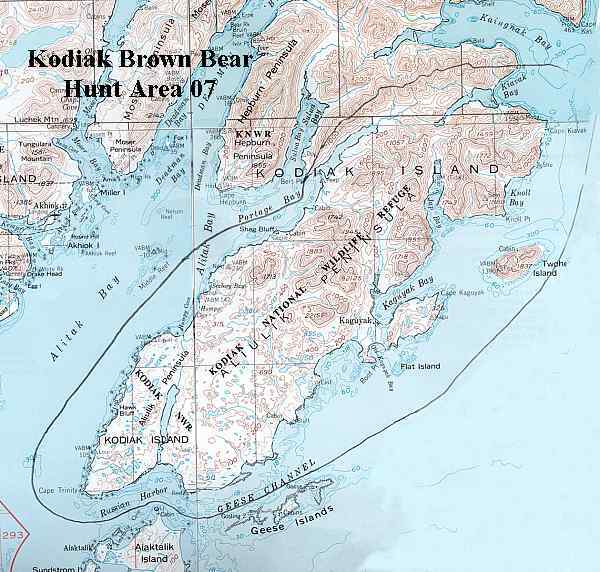 Kodiak National Wildlife Refuge manages most of the lands in this area, with some Akhiok-Kaguyak Inc. and private lands around the old village site in Kaguyak Bay.